Two years ago I participated in Ride the Rogue, a fun cycling event that highlights and raises funds for the Rogue River Greenway. 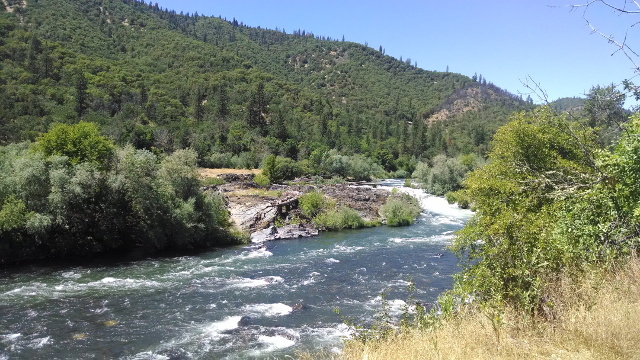 The long-term plan for the Rogue River Greenway is to connect Grants Pass to Central Point; from Central Point, people can take the Bear Creek Greenway to Ashland. 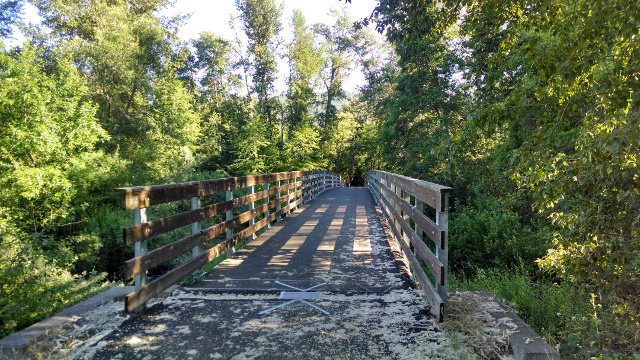 I thought it would be great fun to ride both greenways together; unfortunately, the Rogue River Greenway is largely incomplete, and poorly documented online (before this page was published, anyway). I did some research and found a grainy map describing the proposed route of the Rogue River Greenway. I have explored that route, and also alternate routes where the proposed route is not practical. I share my findings here in this page. Disclaimer: bicycling on public roads and bike paths is dangerous. If you choose to follow routes described in this web page, you do so at your own risk! As you can see, the map is so lacking in practical detail as to be useless. Hopefully this map will be more informative. There is a nice paved trail 1.2 km (3/4 mile) that goes through beautiful old hardwood trees from the end of Spalding Avenue to Tom Pearce Park that is meant to be part of the Rogue River Greenway, which I'll refer to as the RRG from now on. Unfortunately, the trail is useless for going to Ashland on a road bike. The official RRG proposed route goes from the east end of the park alongside the railroad tracks. I had hoped that I could find some path from Tom Pearce Park to Foothill Boulevard, a distance of 400 m (400 yd) or so. Unfortunately no such track suitable for a road bike exists, although it might be possible to bushwhack it on a mountain bike. Worse, there is no way to get from Tom Pearce Park to Foothill Boulevard on a road bike without back-tracking all the way to the start. Don't take this route unless you're on a mountain bike or on foot. If you do take this route, watch out for tree roots making bumps in the pavement, which can be hard to see in the shade on a sunny day. 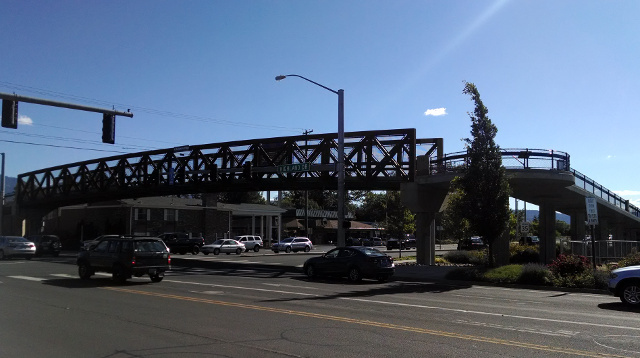 The official RRG proposed route follows the train tracks all the way from Tom Pearce Park to the city of Rogue River. Until local governments get the cooperation of the railroad, which owns the land, this route is illegal to follow. However, there is a perfectly good alternative route from Grants Pass to the city of Rogue River: Foothill Boulevard. Foothill Boulevard has no shoulder, but traffic is usually fairly light. From Agness Avenue in Grants Pass to Depot Street in Rogue River is 12.6 km (7.8 mi). If traveling from East to West, there is a very steep hill to climb just outside of Grants Pass. This 6.6 km (4.1 mi) part of the RRG is completed, and is a lovely ride. There are numerous map kiosks, making the trail easy to follow. Alas, this segment is all too short, and you soon come out at Twin Bridges Road. If continuing on, ride North to North River Road and take a right. This 5.3 km (3.3 mi) segment hasn't been completed. North River Road is a typical Southern Oregon country road, with a rough chip-sealed finish and no shoulder. Traffic is light and the countryside is lovely. Downtown Gold Hill is a fairly easy ride. There is a bike path immediately adjacent to the road for part of the way. The speed limit in Gold Hill is low, and motorists seem to watch out for bicyclists. There is a nice paved bike path that runs along the west side of the river to the Gold Hill Sports Park, which is intended to be part of the RRG, but the proposed bridge across the river at the Sports Park doesn't exist yet, so that bike path is a dead-end. I recommend that you skip it and stay on the main road, which turns into Highway 99, instead. The proposed route of the RRG turns left on Upper River Road to follow the river. This segment hasn't been completed. Upper River Road goes north following the river and the train tracks. There is a wonderful view of Ti'lomikh Falls, which is more of a series of rapids than a waterfall, but still quite impressive and beautiful. This road is quite peaceful with magnificent scenery. Unfortunately, after three kilometers or so (two miles) the pavement ends and the road becomes gravel! This came as quite a surprise to me. Too bad, because I had been looking forward to exploring the loop that the river makes around three mountains, bypassing the noisy I-5 corridor. Upper River Road eventually becomes Gold Ray Road. I recommend that you not take this segment on a road bike. Highway 99 makes an acceptable alternative. Eventually I drove my car to explore Gold Ray Road, and discovered some of the best scenery in Southern Oregon. If you're riding a mountain bike, I'd highly recommend taking Upper River Road and Gold Ray Road. This 9.7 km (6 mi) segment isn't on the official RRG route, but is instead a bypass. It was my least-favorite part of the ride. There is a narrow shoulder, but there is lots of fast-moving traffic that doesn't slow down or move over, and there is a fairly steep hill to climb. My advice is to power through this segment as quickly as you can. Highway 99 follows Blackwell Road out of Gold Hill; when Blackwell Road dead-ends, turn right on Kirtland Road to stay on Highway 99. Highway 99 crosses over I-5 at exit 35; you'll want to turn left on Dean Creek Road, which is the frontage road on the north side of the interstate. Dean Creek Road's only purpose in life seems to be to take people the short distance to the Bear Creek Greenway trailhead. It's very bumpy and could use repaving. 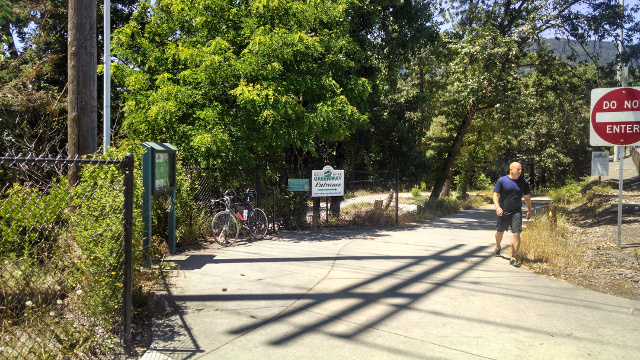 Compared to Highway 99, the Bear Creek Greenway is paradise. It's smoothly paved, generally well-marked, and goes 28.8 km (17.9 mi) all the way from Central Point to Ashland. The BCG, as I'll call it, does run through some woods that homeless people use for camping, which causes concern for some people; my point of view is that if you treat the homeless with respect, as people rather than bums, and leave them alone, then they will leave you alone. I saw a tent or two but I didn't have any problems with anyone. Lots of people travel the BCG on nice days, so surely troublemakers get removed quickly. I enjoyed the BCG quite a lot, and I'm grateful to the visionaries that bought the land when it was cheap and paid to pave and mark the trail. The BCG travels through a variety of land, part urban and part wilderness, and in most places is completely separate from motorized traffic. Most road crossings even have underpasses or overpasses. The BCG passes through several parks offering drinking water and bathrooms. The only thing I didn't like about it was the constant roar of traffic from I-5, which was never far away. The two bridges over Bear Creek were especially beautiful. Watch out for tree roots making bumps in the pavement where the trail runs through the woods though. There was construction on the trail in three places when I was there. Although I did ride the route described in this web page, the map was generated with Google Maps, GPS Visualizer, and Google Earth rather than a GPS device. The map surely doesn't exactly reflect reality on the ground; I'm fairly certain that the route doesn't include information about detours around the segments under construction or repair. Here is the route as a GPX file and as a KMZ (Google Earth) file. If you load either file into your GPS device and attempt to follow it, please keep the disclaimer at the top of this page in mind: you do so at your own risk.